The image above is striking. 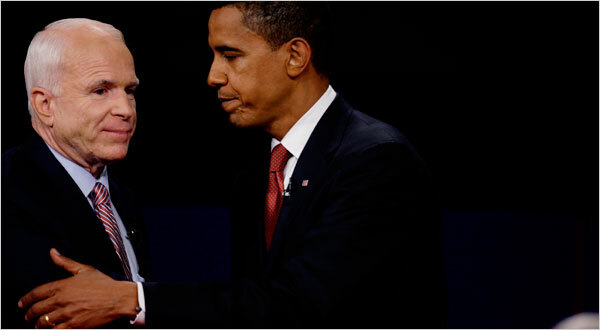 Taken at the debate last night, this photo shows the two candidates greeting each other on stage. John McCain, the Republican nominee, older, more experienced, stands quietly and passively, while Barack Obama, the Democratic nominee, younger, impassioned, and well-studied, leans over in a gesture of greeting. The two men are shown in crystal-clear contrast, and the viewer is left to see the Old Guard being passed over in favor of the New Leadership. Overall, I was disappointed in the debate last night. Neither man really spoke to the other, as encouraged to by moderator Jim Lehrer, although Obama made an effort to address his opponent directly. Both candidates evaded questions, particularly about how they would adjust spending based on the current economic climate. Answers were vague: McCain said he would "rein in spending" without saying what spending he would cut. Obama spoke well about his top priorities (energy, health care, science and technology, and education) but couldn't offer anything that wasn't a top priority. I admit, I continually kept thinking that John Kerry was a much better presidential debater in 2004. But then again, Kerry debated against Bush, as opposed to McCain, who is at least much smarter than our current president. According to the Wall Street Journal online poll of readers, Obama won the debate. I would agree, but part of what pushed Obama over the edge of the close encounter was his style. In split screen views, McCain spent the time while Obama spoke by laughing to himself, blinking rapidly, and not paying very much attention. In contrast, Obama listened carefully to what McCain said, and made very few quirky facial expressions. In speaking, Obama used no Washington insider language, and used good rhetortical phrasing (i.e. "Let me speak clearly..."). John McCain often appeared stiff, which only added to the impression of his age. Obama enjoyed many advantages, not least of which was his choice of running mate. When speaking on foreign policy, Obama specifically mentioned choosing Joe Biden for his Vice Presidential nominee because of his foreign policy experience. This indicates a willingness to lean on others for their expertise, creating a Master Mind, if you will. On the other hand, McCain was unable to speak of the advantages of his running mate, Sarah Palin, because she believes her proximity to Russia equates to foreign policy experience. Knowing this, I felt it was ridiculous for McCain to be continually telling Obama "you don't understand" foreign policy. I believe Obama to be the winner of last night's debate, but not by much. I would hope that in their next meeting, both candidates would bring more discussion to the podium, instead of more planned speeches. And I would also hope that someone would bring some BenGay for McCain, to keep him from looking so stiff. 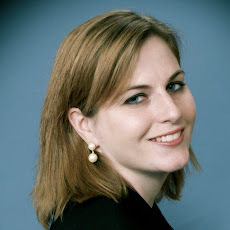 "I often wonder if anyone considers that angle when looking at McCain's candidacy." Very much (me), and frequently (many others). I am grateful that McCain did not select a stronger (as distinct from more popular) running mate. The selection he did make didn't hurt him, initially, and in fact helped him (possibly to his own surprise), but it isn't helping him now. But the real question is, "is Sarah Palin a big enough liability to bring down McCain?" In the current climate, I'm not sure she is. While I won't vote for McCain, I'm sure there are some people who in the current fiscal crisis will want a longtime politician in charge. There are people who would not have voted for McCain who now will just because Palin is there. There are people who would have voted for McCain who now will not, for the same reason. My gut sense is that the former number is smaller than the latter, for a net loss. The question then is, can McCain sustain that loss and still win. I don't know, but my guess is no - not in this economic climate - unless he can successfully decouple his image from that of Bush. He needs the base (and others, of course) to believe that his leadership abilities and style can work in this environment, and thats a hard sell. Its not impossible, though. If he can present himself quickly as an effective economic force, he can do it. So far, he hasn't. Neither has Obama -- but Obama sounds as if he understands the concepts that are driving the crisis. McCain may, too -- but he isn't presenting that image. As for being a long-term politician -- I think thats a negative image, these days. I can see plenty of people saying that McCain was with the group that got us into the fiscal crisis, and he would be in a better position to understand it and how to get out of it. I don't recall people saying that he could get us out, but I do recall the "I'm a war president" logic. It only made a little sense to me then, and less, of course, later. As for the second point, I'll quote (I think) Will Rogers -- "If stupidity got us into this mess, why can't it get us out?"